The parietal cell antibody test measures antiparietal cell antibody blood levels. What is the parietal cell antibody test? The parietal cell antibody test measures the parietal cell antibody blood level. Why is the parietal cell antibody test important? The antiparietal cell antibody test is used in diagnosing pernicious anemia. This Parietal Cell Antibody Test is a blood test. The parietal cell antibody test, also known as an antiparietal cell blood test, measures antiparietal cell antibody blood levels. Parietal cells are special types of cells found in the stomach. These cells are responsible for secreting hydrochloric acid (HCl) for digestion and also something called intrinsic factor that is involved with vitamin B12 absorption. The immune systems in some people, for whatever reason, create antibodies that attack their own parietal cells, causing damage that can lead to decreased vitamin B12 absorption. This leads to a condition called pernicious anemia which is largely caused by the vitamin B12 deficiency. Because of its close association with B12 and intrinsic factor, this parietal cell antibody blood test is frequently ordered with the B12 blood test and the intrinsic factor test. Approximately 80% of people with pernicious anemia will have detectable levels of anti-GPA antibodies. The parietal cell antibody blood test measures the levels of gastric parietal cell antibodies (GPA). As can be seen on the antiparietal cell sample lab report, GPA antibody levels are reported as a numerical result which can be compared against the reference ranges provided by the lab. To get a parietal cell antibody test near you, order online and get your blood drawn at the Quest Diagnostics lab that you selected. 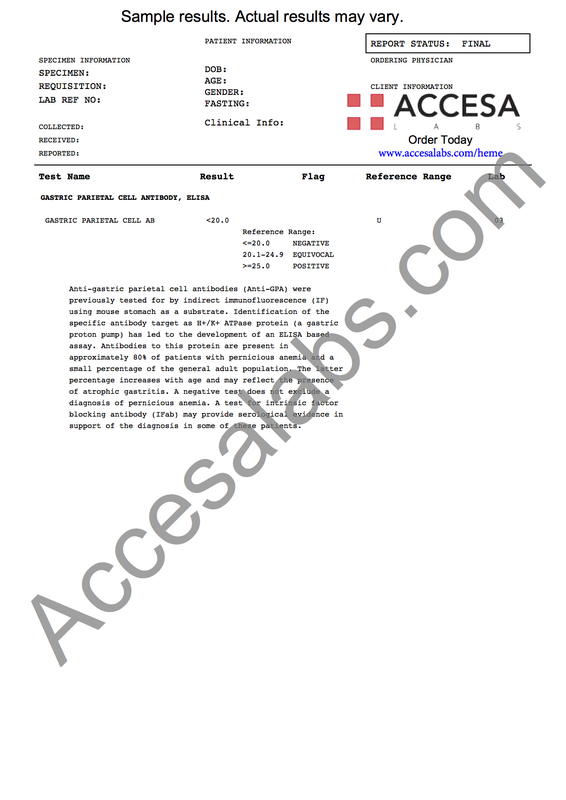 Once your parietal cell antibody lab report is ready, it will be available for download. The parietal cell antibody test is sometimes ordered along with the anemia test panel for a more comprehensive anemia screening. Sickle cell anemia screening is better performed through the sickle cell test. Parietal Cell Antibody Test at Guaranteed Prices.